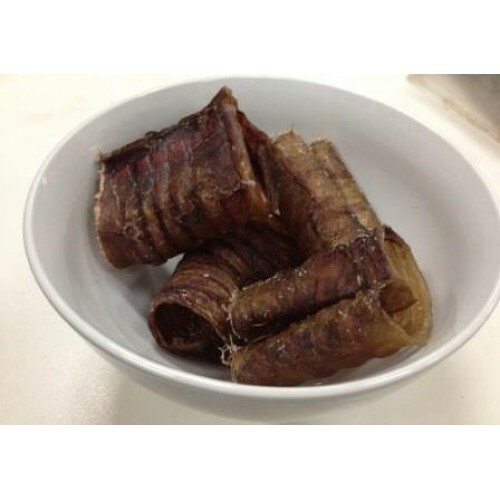 Bovine Trachea is a great chew for all sizes of dogs - the important thing is to size the chews appropriately - this is why we've got small, medium and large size Trachea available. We know that when you purchase products you want to be sure that they are appropriate for your dog. Apart from the chewability factor, Bovine Tachea is a great source of collagen for our dogs. Collagen is an important protein component of hair, bones, cartilage, ligaments and tendons and is necessary for healing injuries as well. So we're not only providing our pooch with a tasty chew when we give a piece of BM Trachea - we're also helping to support thier health and wellbeing!